How Hydrocolloids are used in Food Industry for Thickening Additives? Hydrocolloids are been used in a wide range of food products as a thickening agent and have significant benefits. It contains a group of long-chain polymers that have the property of forming gels when dispersed in water. Studies showed that a large number of hydroxyl group increases the affinity rendering to form a hydrophilic compound. Hence, they are appropriately been termed as ‘hydrophilic colloids’ or ‘hydrocolloids’. Hydrocolloids are used in the food industry in order to modify the rheology of the food system. It includes with its two basic properties of food system namely as flow behavior and mechanical solid property. Various foods like sauces and toppings, salad dressings hydrocolloids are been used as a food additive so as to obtain desired viscosity and mouthfeel. Other than this they are also used in jellies, desserts, ice cream, and jams etc. so as to create the desired texture. Hydrocolloids used in baking increases shelf life, dough conditioning, prevents lump formation, retards staling of bread etc. The process of hydrocolloids been used as thickening agents involve the non-specific entanglement of conformationally disorder polymer chains. It acts as a polymer-solvent interaction. 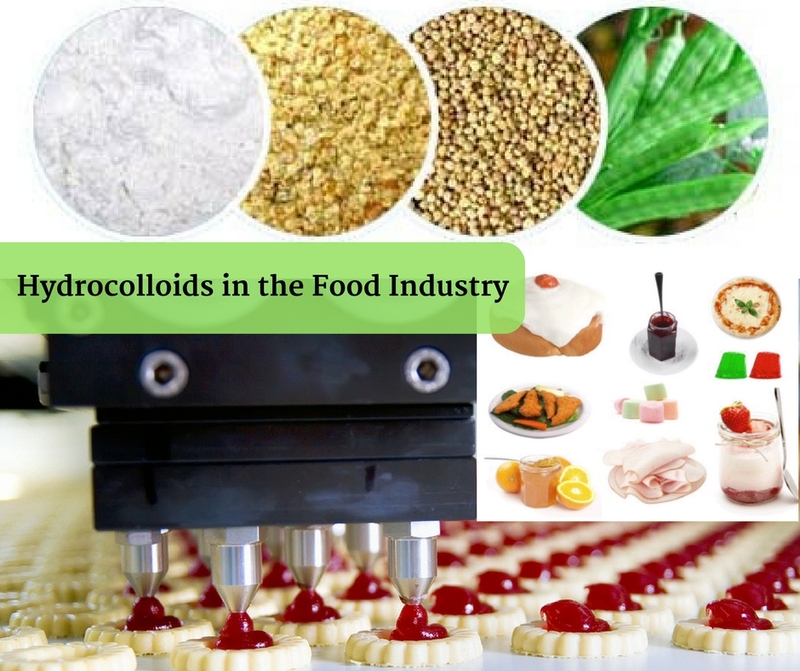 Hydrocolloids used in the food industry include starch, guar gum, locust bean gum etc. The thickening effect depends on the type of hydrocolloids, the food system in which it is used, pH value and food temperature of the food system. Along with these properties, there are also various health benefits of hydrocolloids that include reducing the risk of cardiovascular disease and help to treat type2 diabetes. Hydrocolloids contain dietary fibers, when taken in food reduces the risk of cardiovascular disease also lowering down the cholesterol level. Different hydrocolloids like guar gum, cassia gum (cassia tora powder), locust bean gum powder, Deoiled tamarind kernel powder (tamarind gum), fenugreek gum powder, linseed gum powder etc. can be taken as intake for high dietary fiber. Studies revealed that dietary fiber such as Psyllium, guar gum etc. helps to decrease the amount of glucose in the body when taken in a sufficient amount. Other application of hydrocolloids is to be used to produce edible films on food surfaces as well as food components. This edible film acts as an inhibitor of moisture, gas and lipid migration. Hydrocolloids materials including polysaccharides are used in the formation of edible films and coatings. Altrafine Gums is a leading manufacturer and exporter of products like guar gum powder, fast hydration guar gum powder, cassia tora powder, tamarind kernel powder, sesbania gum powder, fenugreek gum powder etc. Our products are been used as a thickening, gelling, additives in different industries like textile, food, cosmetics etc. We deliver the products with in-depth research providing cost-effective and outstanding services. For more information, contact us today and know about different hydrocolloids and how they are been used in different industries.